Jurgen Klopp was not too downhearted after Liverpool were held to a 1-1 draw against Leicester in difficult conditions at Anfield. The Reds took an early lead through Sadio Mane, but the Foxes equalised right before half time with Harry Maguire’s finish after a free-kick wasn’t cleared. 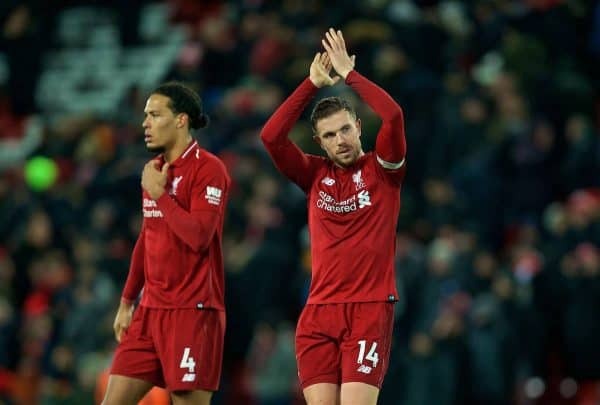 In the second 45 minutes, Liverpool largely dominated and had a couple of moments which could have seen them take all three points, but the overall performance was below-par and a point apiece was a fair result. Klopp noted in his post-match press conference that the decision to not give Naby Keita a penalty, when he was clearly fouled in the box, was a big moment in the game. “A penalty is a penalty,” he said. “There was no blood again this time, but it was still a penalty. Elsewhere, the boss was asked on his decision to field Jordan Henderson at right-back, over other candidates including Rafa Camacho. “We had to find a solution. We thought about Rafa. But in the end, we decided on experience in that position. Klopp acknowledged that the result could have been better—but with Man City losing one night earlier, the Reds have extended their lead even with this draw. Now it’s on to West Ham and Bournemouth and, as the manager was happy to point out, Liverpool simply have to continue looking to win their matches as they come.